A youth enhancing detox treatment that utilizes earths most powerful mineral clays and rejuvenating botanicals to visibly smooth and brighten the look of skin. The water activated powder formula instantly transforms into a velvet mud, draping skin in a fresh dose of glow activating nutrients with each treatment. Vitamin C rich fruits instantly brighten the look of skin, as activated charcoal lifts away impurities and stimulating clays decongest pores- indulging your skin in a decadent detox that leaves skin feeling re-energized and rejuvenated. Pro-Tip: Customize your treatment by mixing mask with honey and/or oil. By mixing oil or honey to the mask it will become a moisturizing mask and will not fully dry on skin. To absorb impurities from pores and blemishes, mix with water and allow mask to fully dry. For those who are new to powder masks, we recommend mixing our powders in a bowl for ease of application and clean up. Take the time to experiment and have fun! I Had No Idea This All-Natural Product Would Banish Every Last Blackhead. Activated charcoal, turmeric root, and rhassoul clay work to make masking with this formula your most cleansing session yet. Blackheads and clogged pores are no match for this multifaceted mask. I know I’m on the verge of gushing, but hereby grant this mask life-changing status. Rich in skin nourishing silica and magnesium, absorption properties clear pores of build up and stimulate youthful blood flow to promote skin repair. Youth enhancing curcuminoids suppress melanin production for brighter skin, and naturally occurring salicylic acid keeps skin blemish free. Primary constituents, triterpene saponins, stimulate collagen production, strengthening skin structure and delay formation of wrinkles. A powerful detoxifier, binds to toxins, pulling dirt and oil and decreasing the appearance of pore size. Rich in Vitamin A & C, boosts collagen production for firmer skin and reduces appearance of brown spots and sun damage. Known as the “Botox” plant, this natural source of Alpha-Hydroxy Acid (AHA) increases cell renewal, removes dead skin cells, and strengthens elasticity. Turmeric is freshly ground for each micro batch. 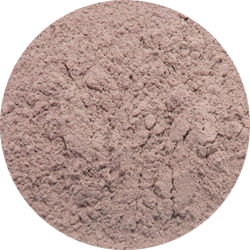 Moroccan clay is unrefined and sun-dried. Wild medicinal plants are distilled to produce therapeutic grade essential oils. 15 active ingredients are hand blended in synergistic quantities proprietary to Root Science. Tried and tested by real people to ensure maximum skin enhancing benefits. Floral notes of exotic hibiscus and sweet vanilla transcend skin to a state of youthful innocence. Concentrated nutrients activate with just a few drops of water, as powder instantly transforms. Rich, velvet mud drapes skin in youth preserving botanicals and mineral clays. Housed in stunning dark violet glass for the highest standard in freshness and potency. Concentrated dry formula eliminates water-induced bacteria and need for preservatives. Violet glass instead of clear prevents light degradation and rancidity. Superior class of organic + wild crafted ingredients are protected for skin safety and efficacy. Rhassoul Clay also known as red Moroccan clay or Ghassoul Clay comes from deep beneath the Atlas Mountains of Morocco. The use of Rhassoul Clay dates back over a thousand years, used by those of high status in ancient Rome and Egypt. The Rhassoul clay used by Root Science is of truly exceptional quality – naturally quarry mined, sun-dried and untreated. Rhassoul Clay contains skin enhancing minerals silica, magnesium, potassium, calcium and superior astringent and absorption properties. It’s been shown to be effective at detoxifying, absorbing oils, increasing skin elasticity, removing dead skin cells, and dramatically improving skin texture. Rhassoul Clay**, Bentonite Clay**, Kaolin Clay**, Curcuma Longa (Turmeric) Root*, Activated Coconut Charcoal, Rosa Canina (Rosehip) Fruit*, Hippophae Rhamnoides (Sea Buckthorn) Fruit*, Hibiscus Sabdariffa (Hibiscus) Flower*, Ulmus Rubra (Slippery Elm) Bark*, Centella Asiatica (Gotu Kola)*, Calendula Officinalis (Calendula) Flower*, Inonotus Obliquus (Chaga Mushroom)*, Glycyrrhiza Glabra (Licorice) Root*, Althaea Officinalis (Marshmallow) Root*, Avena Sativa (Oat) Kernel Flour*. Use weekly. Mix 1 tsp dry formula with 1 tsp warm water in a bowl to form cleansing mud. Apply a thin layer onto face, avoiding eyes and lips. Allow mask to dry (15-20 minutes). Rehydrate mask and massage for gentle exfoliation. Rinse, pat dry and finish with a facial serum. A truly eye-opening mask, as you can feel the skin tighten and you cannot blink. I joke, but it truly is a great product that works. Every time I use it I get a compliment on my skin. This mask is amazing, and I love what the company stands for. Super impressed with my results and it’s only been 4 weeks! I’ve been using the mask once a week per your instructions and I’ve noticed a big improvement in the texture of my skin. Skin feels smoother and pores are squeaky clean. Fantastic product and will definitely be repurchasing! Another amazing product! I’ve been head over heels for the youth serum but when I added the mask to my routine my skin’s been transformed on a whole other level! Blackheads are non existant and my skin is plumper, you can really see the results after just one use! Amazing! 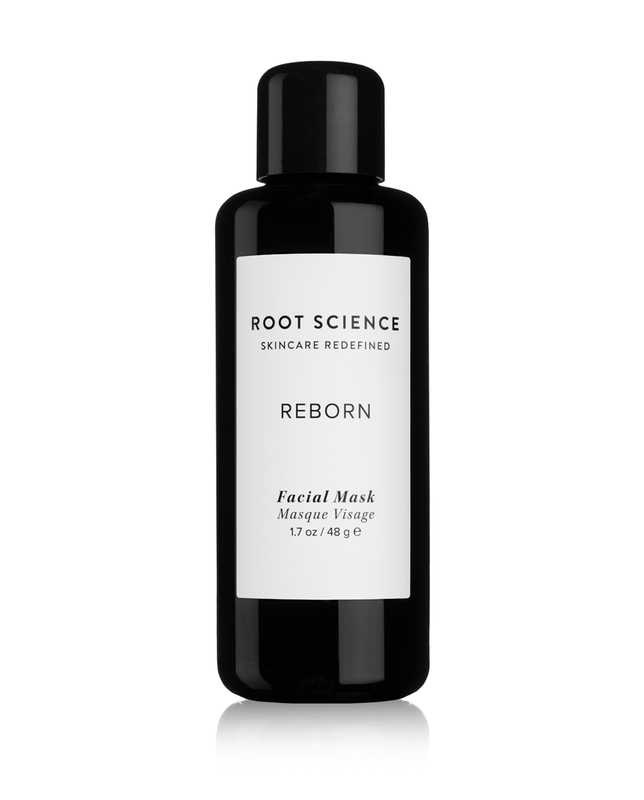 Cant get enough of Root Science products (and the compliments don’t hurt). Thank You for making another stellar product that I cant live without! Love this mask! It helps even my skin tone and shrinks my pores. Can’t wait to try more products! The RS Reborn mask feels absolutely amazing and leaves my skin looking fresh and rejuvenated! I follow up with the RS Youth Serum and my results are stunning! Feels like I just received a very $$$$ facial but in the convenience of my own home! I’ve used masks in the past but they’ve all been mixed with additives that irritate my skin. It’s nice to know that you are receiving a pure, clean product with 100% natural ingredients. I don’t mind having to add the water myself as I know a little bit of effort is worth long term results!